Simply put, it is not a “crime” to deny service based on religion. We’ve seen muslims demand that no one bring pork or alcohol through their line at a grocery store, or sue an airline for “forcing them” to go against their faith. The latter is actually worse, because the muslim in question converted after getting the job, and her co-workers were willing to make sure she didn’t serve the alcohol on those flights. Both of those cases were not about embracing or exercising their faith, but about forcing others to do it with them. The idea of all of these cases is that people today firmly believe that they have a “right” to whatever they want, and can sue and attack people for saying no. Back to the bakery, though, not even 20 years ago, this would not have gone to court, but rather would have been handled by the local economy. If there truly were enough people “outraged” or “offended” by this baker, then their business would have dried up and they’d have been forced to close by not having business. Today, however, they’re all but burned at the stake, simply because a small percentage of the population is hell bent on not only “exercising their rights to equal protection under the law,” but also to forcing others to praise and give in to them. Very shortly after this baker was sued, a man called bakeries owned by those in the LGBT community, asking for cakes or cookies with scriptures on them. When he was told no, called every name in the book, verbally abused, HE DID NOT SUE, he simply posted the story online. Naturally, he was requesting “offensive messages attacking people for their beliefs” and was lying when he showed what the scriptures he wanted referenced said, proving this isn’t about freedom, it’s about forcing people to change to accept and praise those they disagree with. We’re getting close to a tipping point, and if we go over that point, you won’t be able to pray in public, wear a cross necklace, or in any way show your faith, for fear of being sued for “attacking” someone or “forcing your beliefs on them.” Those who have read Revelation know it’s going to happen, but are we really going to help hasten that day? Old, but are they harbingers of society to come? These two stories show an attitude that has been growing in the last few decades, one of entitlement and arrogance. In California and Louisiana, Firefighters have been cuffed, if not arrested, at accident scenes, for blocking traffic, which is standard procedure when called to the scene of an accident. I have personally responded to more than my fair share of vehicle accidents, several just to block or direct traffic while the EMS crew works on the victims. I don’t care if there’s no fire, if the tones go off, we respond. At this point, I’m waiting for a “feminist” to all but assault a first responder for “assaulting a woman” by simply carrying her away from an accident, or for “illegally detaining” someone who should be kept immobile until cleared by an EMT. We live in a country where people have been told for decades that they have a “right” to this or that, or that there is not “right or wrong” only what you decide. How long until Police are called and told to kill someone because it’s the caller’s “right” to have their “assailant” killed for “denying their rights?” We’ve seen children kill their parents for the smallest of things, children report their parents for “abuse,” that being not buying a new PS3 or XBox1, and even laws prohibiting police from interfering when someone who does not have custody wants to transport a minor across state lines for an abortion, because the girl would be “abused” by being told her parents were disappointed. At this point, I’m waiting to be told that as a white male, I’m not allowed to earn a salary, am required to kneel in the presence of all non-white-males, and am required to hold my wallet open while doing so. We’re headed to hell in a nitro fueled handcart people, and unless we wake up, we’re close to a hot welcome. Author Sheepdog SmokeyPosted on WedWed-OctOct-2015201520152015 Categories Smokey's rants, SocietyLeave a comment on Old, but are they harbingers of society to come? I’ve almost gotten to the point where if I don’t see some idiot complaining about America’s “gun culture” I begin to wonder if I’m dead and gone, though I don’t wonder that too often. The latest is an idiot who posted how she could “disarmed this dude and fired all his rounds without much effort” as if she has the right to (1) steal someone’s firearm and (2) discharge a firearm in public just to “prove he shouldn’t have one.” Next, this was in New York (unless there’s a Manhattan, TX idiots prefer to buy coffee in,) where it’s only Law Enforcement Officers who carry openly, everyone else must carry concealed if they’re licensed. I can understand culture shock, and this woman, being from Europe, is naturally unused to a country where the population is armed. In the UK, it’s rare for even police to have more than melee weapons (asps, clubs, etc), tasers or the like. But this woman wants to present herself as “trained” even if minimally, and then claim she should be able to legally disarm someone when she is not a LEO, and two, doesn’t recognize that the holster is in fact one made to make disarming the person using it very difficult. I didn’t spend much time as a corrections officer, and never was licensed to carry a weapon, but I do know a few things. First, the weapon is private property or city property, either way, it’s theft to take it, crime number 1. Second, that is a law enforcement officer, so it’s rather stupid to think you could get the weapon, and not get beaten to a pulp. We no longer live in a world where some criminals will shoot first when confronted while breaking the law, but one where people go hunting for officers. The police are very touchy, moreso now than ever, about people trying to take their weapons, and if someone tries, it’s likely the idiot will be shot! My final complaint is the attitude that seems to be taking over the world, the “America is the problem” right up until the “save us America” cry. I guarantee if anyone went to the UK, Spain, France, Germany, or any other country, to work or just to live, and started publicly ranting about how “horrible” that country is, or how “backward their laws are,” that person would be deported very quickly, as long as their not muslim and screaming about discrimination and tolerance of course. So, to wrap up another rant, what are your thoughts on this? 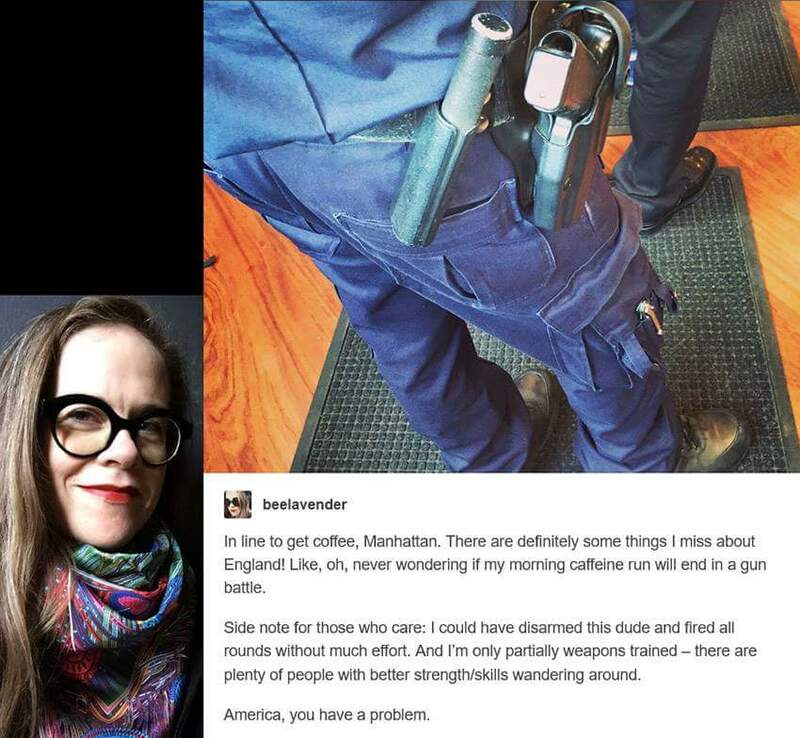 Also, I can’t help but wonder if we found this woman’s Facebook, Instagram, Twitter, Pinterest, etc feeds and posted this picture with well thought out, well argued, civil and logical statements about the sheer idiocy of thinking she could disarm a cop, didn’t know the holster alone wouldn’t allow that before the cop had her in cuffs, and about how the laws here are not subject to the whims of foreigners who are here enjoying the country they’re berating, just what would her reaction be? 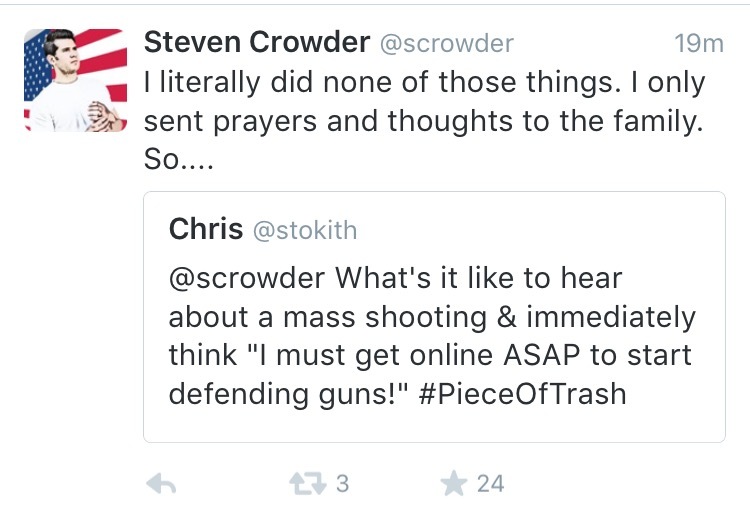 And once again, the loudest reaction is the BAN ALL GUNS NOW OR YOU’RE A MURDERING PSYCHO chant from the left. Sadly, they’re believed, and not by a small percentage of the population. They say that gun control works by saying the states with the strictest gun laws have the lowest violence, which is a bald faced lie. One need only look at Chicago or Detroit to see this, as MI and IL have some of the most restrictive laws in the US regarding owning a firearm, and are in the top (if not AT THE TOP) of the numbers for gun violence. To put this in context, as UCC was a “gun free zone,” meaning signage to that effect was posted, likely everywhere, would you leave a sign on your door that said “I’m not home and it’s unlocked” and then not expect to be robbed? Of course not. You don’t advertise your weak points, you hide them. Sadly, when someone who is legally carrying a weapon stops a crime, they are demonized and dragged through the mud in the press as a “gun nut who puts people in danger” or some such idiocy. THIS MUST STOP! We need to stop pandering to the lowest common denominator, to stop letting the idiots be the loudest, and start demanding that the truth be reported. 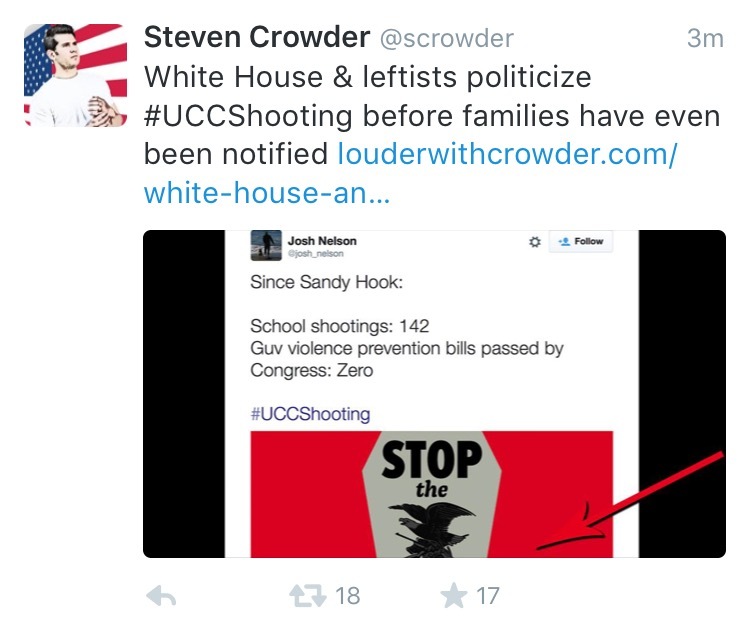 Yes, it is a tragedy that people died at UCC, and I honestly hope this idiot enjoys his time in hell. Unlike many, I want those who do this and survive their rampage to be put to death in a painful manner. Gilbert and Sullivan said it best, let the punishment fit the crime. You stab someone 87 times, you get stabbed 87 times. You shoot someone, you get shot! I realize that’s not popular, but why are we concerned with the rights of someone who murdered innocent people? Simply put, we’ve been told for decades that “it’s not civilized to sink to their level.” While true, it’s not civilized to sink to their level, it’s not sinking to their level to put to death someone who murdered others. I realize we won’t return to hangings or embrace Gilbert and Sullivan’s suggestion, but we need to remove people like this idiot not only from society, but from the planet’s breathing population. Finally, what angers me outside of the fact that someone who should have been locked up long ago based on what leads people to do this, is that others are perfectly happy verbally attacking those who would “dare” suggest that, had their been someone who could fight back with force equal to this idiot, lives could have been saved. 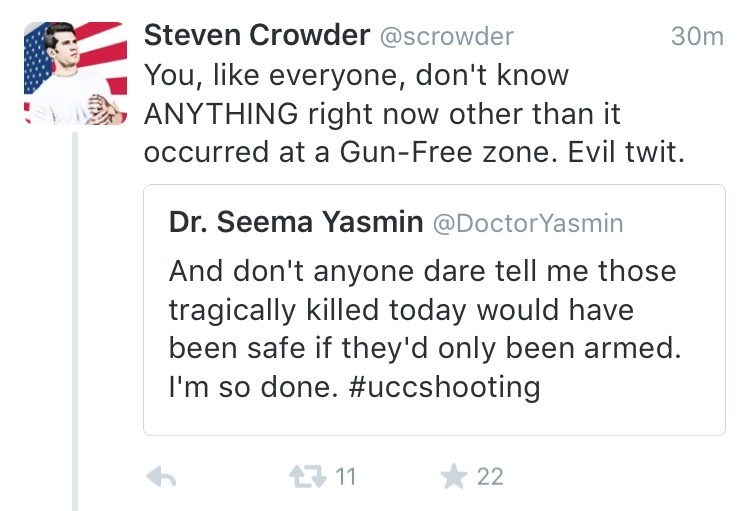 These are the people who firmly believe a “no guns allowed sign” is the equivalent of Dumbledore casting a spell to prevent any gun from crossing that line, and also the same group seen on the news, utterly confused about “how such a thing could happen here” after a criminal ignores their magical boundary marker. In a country where criminals sue those who they victimize, I wonder what would happen were the families of the victims at UCC to sue the college for ensuring they were as vulnerable as possible? Well, I’ll tell you this, I won’t stand for it or take it any more. Yes, you’re free to speak your mind, and I’m free to do the same. You spout idiocy at me, I’ll tear down your “logical argument” in a civil manner and leave you crying. You throw insults at me, I’ll ensure those around you know that your parents were either horrible at raising kids, or not there. And above all, you actually dare to attack me physically, I’ll have you on the ground, your right hand scratching the back of your left ear, and my knee on your back in seconds, so make the only shot/punch/kick/whatever count, as I’ll make sure mine all count.